High School District 211’s Food Service team of 110 employees serves roughly 9,000 students daily providing more than 4,500 complete lunches and 1,000 complete breakfasts. Since September 2013, a 14% increase was seen in the number of students served, which equates to an increase of approximately 550 meals served to District 211 students each day. Each school follows the Federal National School Lunch Program guidelines outlined in the Healthy Hunger Free Kid’s Act. Menu items have lower fat levels, fewer calories, and primarily consist of whole grains, fruits, vegetables, and lean proteins. The updated guidelines not only benefit all students, but also provide nourishment for those who do not have access to well-balanced meals outside of school grounds. The program allows the District to provide qualifying students meals at a free or reduced rate based on household income. 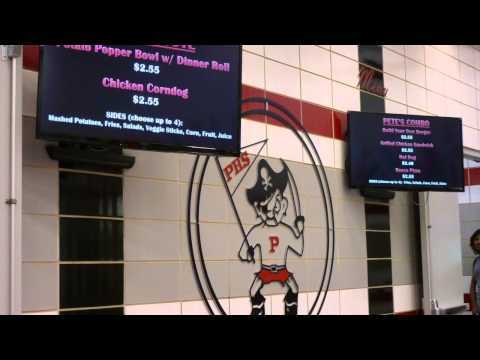 In an April 2014 audit conducted by the Illinois State Board of Education, District 211 received compliments on its well-run food services program, attributing the success of the program to the District’s support. The report specifically praised the variety of menu choices for students, who now have a variety of 11 entrees to choose from each day, as well as the presentation of serving lines. Additionally, the audit mentioned the impressive teamwork of cafeteria staff and student acceptance of the food services program. The District’s Free or Reduced-Price Meal status continues to increase, with 35% of families district wide qualifying for assistance with breakfast and lunch. In order to expedite the application process, an online application for Free or Reduced-Price Meals was made available for the first time at the start of the 2014-2015 school year. Computers were made available at schools during registration, in order to help accommodate families without online access. The standard hard copy Free or Reduced-Price Meal application is still available for use.